So you’ve done some calculations, and you’ve decided to build a pool. Fantastic! But what kind is best for you? For your family? For your home? 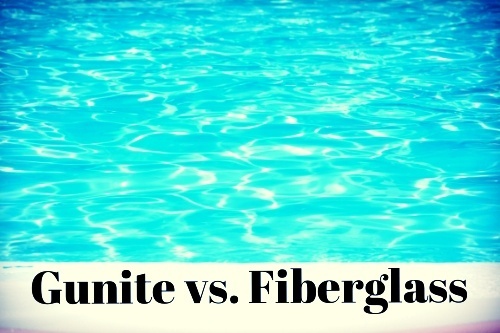 With the lawn-damaging nature of above-ground pools and the instability of vinyl-lined pools, the main debate comes down to gunite (or concrete) versus fiberglass in-ground pools. Thankfully, we’ve got a breakdown of the benefits and drawbacks of each, so you can make the right decision for you. Gunite Pools are an investment, in both time and money. The multi-step construction process can take anywhere from 4 to 12 weeks (depending on the size and customization of the pool). But at the end of construction, you have a steel-reinforced, concrete pool—custom-made to perfectly fit your vision. Because they are customizable—unlike the prefabricated shells of fiberglass pools—gunite pools are ideal for limited installation spaces and challenging terrains. The initial costs of gunite and fiberglass pools are comparable. Gunite pools do require routine maintenance to prevent algae build-up and discoloration and may need to be resurfaced over the course of their lifetime, which can increase costs. However, gunite pools can be rehabilitated to be brand new, whereas fiberglass pools can never be remodeled to original factory standards. Gunite pools can be drained completely, which can cause fiberglass pools to crack. Gunite pools are an investment, but with proper maintenance, they can be your oasis for years to come and increase your property value should you decide to move. Fiberglass Pools have the shortest installation time of any in-ground pool, because the shells are premade off-site and “dropped” in one piece into the ground. Although the shells are premade and cannot be customized to the extent of gunite pools, fiberglass pools come in an array of shapes and sizes. They also involve less weekly maintenance, as the shells are nonporous and not subject to algae growth. Fiberglass pools are not as durable as gunite pools and may have structural and gel coat problems in the future, such as blistering. Blistering occurs from water intrusion from the outside of the pool wall. Though many fiberglass pool shells come with a long-term warranty, the warranty may not cover everything. As you can see, there are pros and cons to both fiberglass and gunite pools. If you’re still on the fence, a trained pool contractor, like Lucas Firmin, can help you decide which best suits your needs. If upkeep is your main concern, Lucas Firmin Pools offers comprehensive maintenance packages to keep your gunite pool in swimming shape. So dip your toe in and test the waters. Contact us here to learn more about our process and get a free quote on a high-quality, customized gunite pool today.